Drew P. Fein graduated from Dalhousie University in Halifax, Nova Scotia in 2011 with a Bachelor in Business Administration degree, concentration in management. In 2015, she received her Juris Doctor from the University of Denver Sturm College of Law, as well as a Certificate in Corporate and Commercial Law. Prior to joining Brown, Berardini, Dunning & Walker, P.C. in 2016, Drew was an associate with the law firm of Gelman & Norberg, LLC. 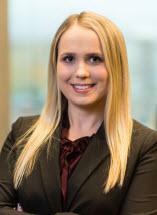 Drew is the Arapahoe County Bar Association's 2018 recipient of the Tommy D. Drinkwine Outstanding Young Lawyer of the Year award, recognizing her commitment to the improvement of our community, as well as her enthusiastic service to clients, the public, and the Arapahoe County Bar Association. Drew is admitted to practice in all Colorado trial and appellate courts and the United States District Court, District of Colorado.